As I was reading this book, I was reminded of my love of the Little House books by Laura Ingalls Wilder. Beneath the Slashings is similar to those books, as it is set around the same era and it's told from a young girl's point of view. Grace is a girl to admire. Having lost her mother when she was six years old and then been separated from her father for three years while he served in the Civil War, she has had a lot of sorrow in her life and reasons to be afraid. When her Pa returns from the war, she learns that they will be leaving the comfort and safety of home to live and work in a lumber camp. Her fears multiply and an animosity toward her father, not present before, develops. The book has a nice little mystery to keep the reader guessing, but it's Grace who really steals the show. As she lives and works among all the men of the camp, she learns to be more trusting. She also learns to do many things she never thought she could when she meets an old Ottawa woman. Ultimately, Grace grows up a lot in her time at the camp and her life is better for it. 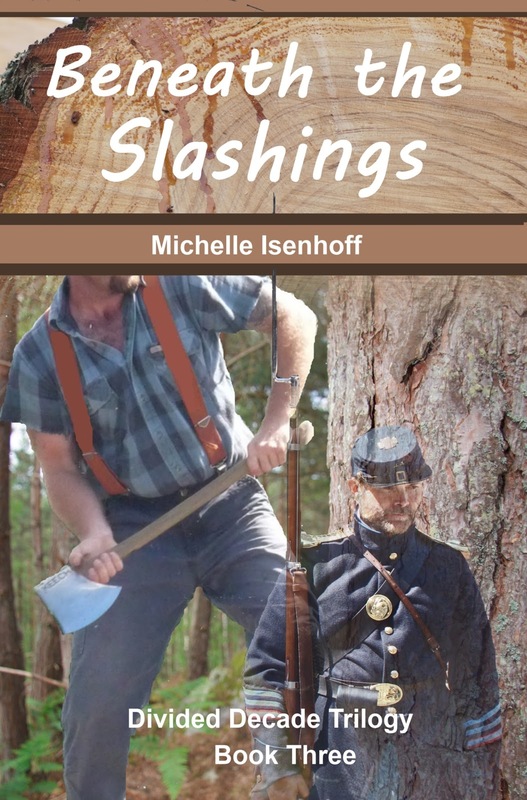 Beneath the Slashings was a great read for me, not only because of what I said above, but because it is set in my beloved home state of Michigan. Hearing mention of Saginaw county, Manistee, and Grand Rapids brings me back to what I loved learning about Michigan when I was a child. In all, this book is a great coming of age story for the middle grades that teaches the reader about courage and friendship. After four uncertain years of war, twelve-year-old Grace Nickerson is desperate to return to a sense of normalcy. But when her father returns from the army, he sells the farm and drags the family off to a lumber camp in Michigan's northern wilderness. Grace is devastated; she's never been brave. When her tears and tantrums won't change Pa's mind, she stops speaking to him altogether. Grace spends long hours working with her brother Sam and Ivan, the surly Russian cook, but at least in the kitchen she is safe from the lumberjacks. She's seen them from the window. They're rough, unkept, and terrifying. But slowly, with Sam's help, she comes to understand they're all missing home and recovering from loss, just like she is. Her fear begins to evaporate--until she learns one of them is trying to kill Pa.
Who is sabotaging the camp, and why? Will the winter in the woods bring the healing Grace needs? Or will it drive a wedge into her family? 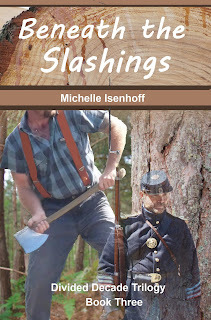 Beneath the Slashings is the final book in the Divided Decade Trilogy, which views the American Civil War from three different angles. But because they’re only loosely related, each book can be read independently. Find out about other stops on the tour HERE. Thank you to Michelle Isenhoff for having me on this tour. I do apologize for the late posting. I was sick on Sunday and today and reading was not fun (did I just say that?). Thank you so much for that thoughtful, positive review, Michelle. I'm glad it stirred some old memories for you as well. I too loved the Little House series, TV and books. If it capture that heart warming feeling it is sure to be around for years to come. Happy National Book Lover's Day! Celebrating my Three Year Blog Birthday! Review Copy Cleanup...Here We Go Again!